According to these statistics, the vast majority of tests administered are the tests you don’t have to do. Considering how little most people know about their rights this is not surprising. Blood, breath, or urine samples at the station or local hospital are generally the only tests required in a drunk driving arrest. A small sample of states penalize drivers for failing to perform tests at the scene, but usually no driver can be compelled to do anything until after they are arrested. If the 70% of people who willingly performed tests at the scene knew how rigged these tests were in favor of the police, perhaps they would join the 25% of people who refused to do anything until they were arrested and dragged downtown? Consider: a professor at Seton Hall made his sober students perform a set of field sobriety tests commonly used in drunk driving stops. (Tests such as walking in a straight line, counting with your fingertips, etc.) He showed a video of these tests to a group of police officers. They said they would arrest more than half of the students. 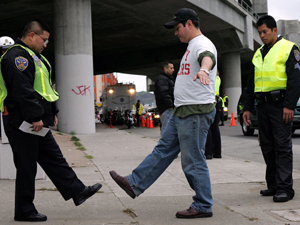 Furthermore the National Highway Traffic Safety Administration recognizes only three field sobriety tests as scientifically valid in showing that someone is above a certain blood alcohol limit. (The NHTSA does not actually say these tests show someone is too drunk to drive; only that there is a probability that the person is above a certain blood alcohol level). None of the probabilities for accuracy in these tests rises above 77%. To muddy the issue further, police officers routinely use other tests not sanctioned as “standardized” by the NHTSA, or render the tests completely useless by flouting the rules for conducting them altogether. Now don’t take this the wrong way. No one should be looking for ways to get out of a drunk driving charge, and no one should really be getting behind the wheel if they’ve been drinking. On the contrary, people who never get behind the wheel after drinking are the ones who should be extremely cautious about doing field sobriety tests. As the above data shows, sobriety is no guarantee that you will actually “pass” any of these tests. In sum, there is another maxim people should remember besides the sage advice of “Don’t drink and drive.” If you are sober, don’t perform field sobriety tests! This is such a wonderful post to remind everyone to follow the law while they are on the road. It is impossible to create a safe journey if there’s a single person who does not follow the rules and ended up risking a lot more of other people lives. Please people, drive careful and try to think ahead to avoid accidents or high risks driving. Think of the people who you love and who love you.